Are you looking for an easy install in few minutes bicycle speedometer? Do you want a bicycle speedometer with day/night LCD back-light display, broadly readable parameters? Are you a searching for a multi-function bicycle speedometer and that keeps all records accurately? Or, do want a wireless and water-proof bicycle speedometer? 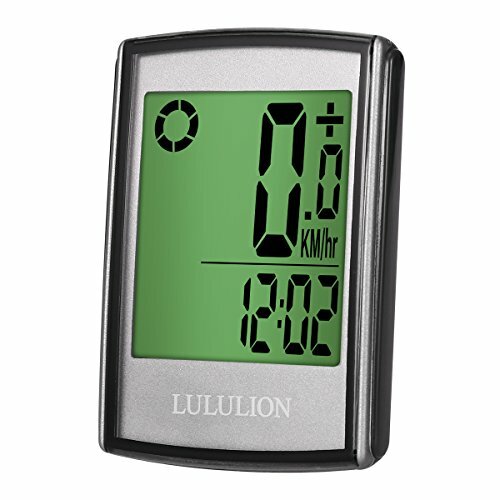 LULULION brand of bicycle speedometer wireless is a 2017 edition of bicycle computer made to compatible fit with most bicycles (ordinary bicycle, mountain bikes, road cycling, folding bike, etc. ); designed with IP55.8 grade water-proof so you could enjoy your biking experience anytime anywhere without having to worry about possible damage from rain. The wireless feature guarantees accurate tracking with the sensor and the computer not more than 60cm. It keeps a track record of your riding time, average speed, odometer, maximum speed, distance, clock, scan, temperature, calorie consumption; The LCD back-light support a glare-free for proper visibility and readability whether at daytime or in the night, even while on the move. Also, the HD big data/number display encourages easy reading without leaning or squinting. It auto wake-up from sleeping mode when it senses the vibration from a bicycle. Perfect for everyday biking, mountain bikes, road cycling, folding bike and much more. AUTO WAKE-UP FUNCTION - Unlike the conventional bicycle speedometer, this new generation bicycle speedometer features an auto wake-up from sleeping mode as it senses the vibration from a bicycle. Perfect for an ordinary biking, mountain bikes, road cycling, folding bike and much more. WATERPROOF & WIRELESS SCREEN - Our bicycle speedometer and odometer wireless are sophistically made with IP55.8 grade water-proof to prevent it from damage if you must ride on a rainy day or in the events that it comes in contact with water. Also, being a wireless technology enables it to keep accurate tracking by holding the sensor and the computer not more than 60cm. MULTIPLE -FUNCTIONALITY - The cycling computer keep a track record of your riding time, average speed, odometer, maximum speed, distance, clock, scan, temperature, calorie consumption. Perfect for an avid cyclist to keep a record and improve speed and performance and great for all kinds of bicycle. LARGE & LCD BACKLIGHT DISPLAY - The bicycle speedometer computer features an LCD back-light display for more precise data reading at both daytime and nighttime. Also, the board data/number display encourages easy reading without leaning or squinting. EASY TO INSTALL - It's effortless to install in just a few minutes by both novice/avid biker and you are set to go with your small bicycle computer. The Bicycle speedometer and odometer wireless waterproof is an excellent gift choice for your friend and family member. If you have any questions about this product by LULULION, contact us by completing and submitting the form below. If you are looking for a specif part number, please include it with your message.